Senate Majority Leader Mitch McConnell says that he and President Trump are in regular contact and are working together on their shared agenda, according to a statement he released Wednesday afternoon. McConnell said that they are working together on tax reform and infrastructure legislation, preventing a government default and funding government operations, as well as passing the defense authorization and appropriation bills and providing "relief from Obamacare." His statement came amid reports this week that he and Mr. Trump have not spoken in weeks and their relationship has been deteriorating. While he did not address their personal chemistry, McConnell countered the idea that friction between them threatens the Republican agenda. "[W]e are committed to advancing our shared agenda together and anyone who suggests otherwise is clearly not part of the conversation," McConnell said. White House press secretary Sarah Huckabee Sanders released a similar statement Wednesday evening. 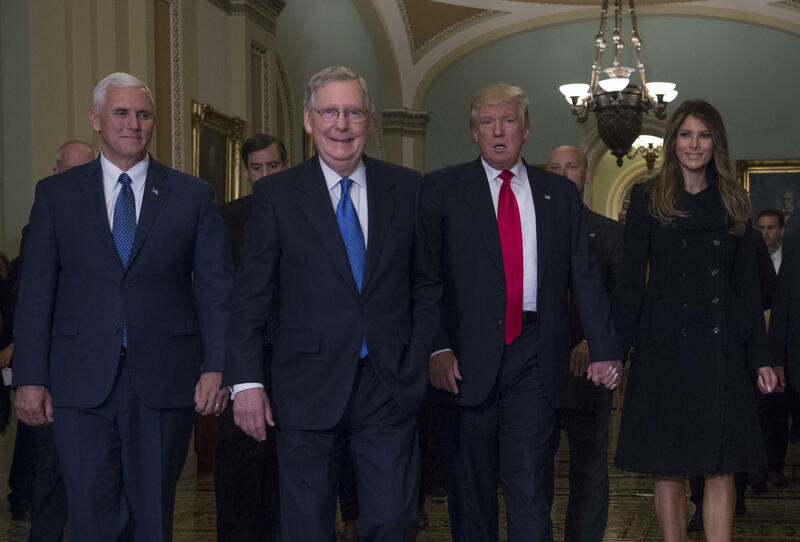 "President Donald J. Trump and Senator Mitch McConnell remain united on many shared priorities, including middle class tax relief, strengthening the military, constructing a southern border wall, and other important issues," she said. "They will hold previously scheduled meetings following the August recess to discuss these critical items with members of the congressional leadership and the President's Cabinet. White House and leadership staff are coordinating regarding the details of those meetings." Sanders reemphasized this point Thursday afternoon in a White House press briefing. "I think the relationships are fine," Sanders said of Mr. Trump and McConnell. "Certainly there are going to be some policy differences, but there are also a lot of shared goals and that's what we're focused on." "President Trump has worked with leader mcconnell to reach out to other members and to work on those shared goals, and we're going to continue to do that when the Senate comes back from recess," she said later in the briefing. Over the past month, Mr. Trump has criticized McConnell for failing to pass legislation to repeal and replace the Obama-era Affordable Care Act, while McConnell recently suggested that the president's expectations were unrealistic. Earlier this month, McConnell said that president, who does not have a background in politics, may have "had excessive expectations about how quickly things happen in the democratic process." The Senate majority leader also said that there were "too many artificial deadlines unrelated to the reality of the complexity of legislating" that "may not have been fully understood." That was enough to set the president off. He tweeted in response, "Senator Mitch McConnell said I had 'excessive expectations,' but I don't think so. After 7 years of hearing Repeal & Replace, why not done?" McConnell tried and failed to get the legislation passed, but his slim Republican majority and the fact that Democrats would not support the repeal of the ACA, meant he had little margin for dissent in his ranks, and the measure fell in the Senate by a single vote. Mr. Trump has also repeatedly called on the majority leader to change the rules of the Senate so that all legislation can pass with a simple majority, instead of the 60 votes that is usually required, an idea he brought up again at a rally in Phoenix Tuesday night. The two also disagree on the truthfulness of the media. At the same rally, Mr. Trump railed against the "fake" and "dishonest" media. On Monday, McConnell said, "My view is that most news is not fake."